Sabre Cat Teeth are dropped by sabre cats, who will always drop either a tooth or an eye of sabre cat, in addition to a sabre cat pelt. All varieties of sabre cat, including snowy sabre cats, vale sabre catsDG and the Sabre Cat Guardian Spirit, have a 50% chance of dropping a sabre cat tooth. If you have the Hearthfire add-on installed, you may need a lot of teeth to furnish your self-built houses. The only reliable source of them is hunting. 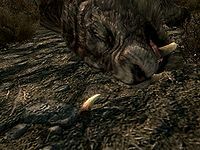 Create a quicksave before killing a sabre cat, kill it and loot its body. If you only find its eye, quickload and kill it again until you get its tooth. Your hunting would be more efficient in this way. This page was last modified on 9 April 2018, at 06:10.